Now that we're officially Caught Up with Criterion, we can do a brand new release: Terry Zwigoff colorful adaptation Dan Clowe's Ghost World! For what it's worth, this is pretty much my favorite film based on a comic book, and it stands pretty tall even outside of those parameters. After a while, there's some funny lines, colorful fashions and a handful of brilliant satirical and humanistic moments that really stick with you. But revisiting it with this new blu, I'd forgotten how strongly it all hangs together as a genuinely touching piece. 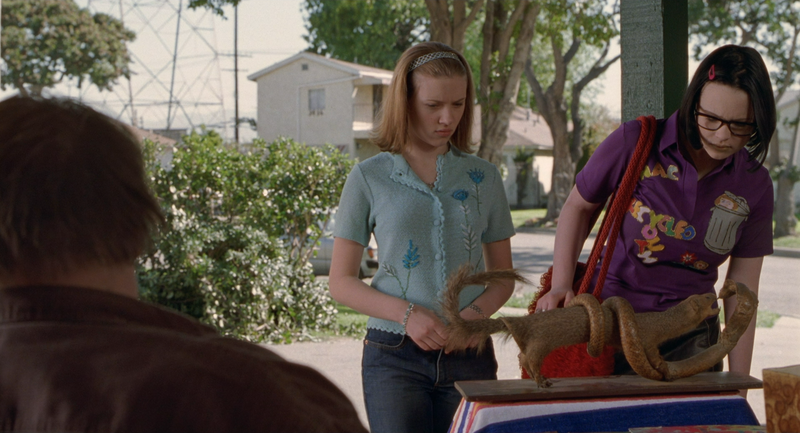 lt's a little hard to believe Thora Birch, coming off of American Beauty, was a bigger star than Scarlett Johansson back then, but then again, between the two of them, it's Thora who really gives the moving, command performance. Of course, some of that might simply be because her character has been shrunken a little from the original comic. Yes, despite the fact that Clowes was hands-on with the creation of this film, this isn't a particularly faithful adaptation of the original Ghost World comic, which used to run as a segment in Clowes' Eightball comic. 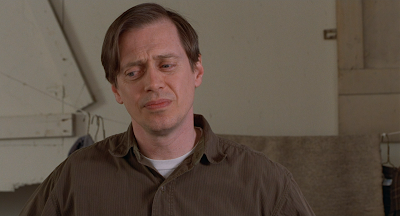 Major characters from this film, including Ileana Douglass's art teacher, the convenience parking lot comic relief character who featured prominently in the marketing, and even Steve Buscemi, who could be said to have replaced Johansson as the co-star. 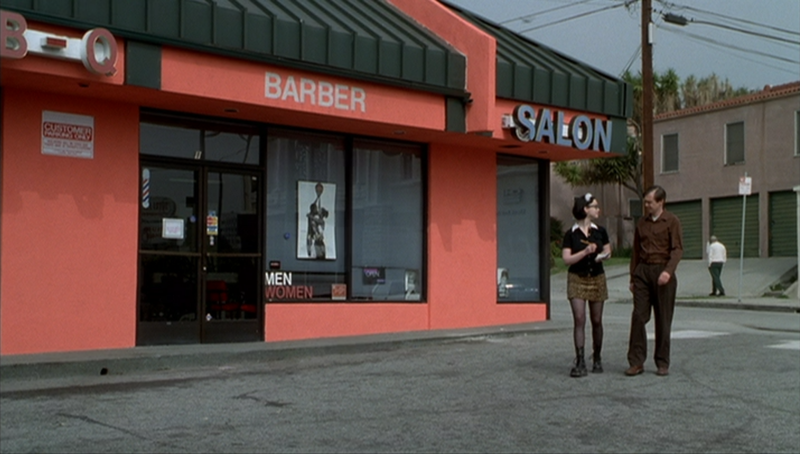 But on the other hand, many scenes and images/ panels seem to be very direct, and through it all, Zwigoff and Clowes never lose the spirit of the original work, even while bringing it to vivid color, and the core story of the two best friends growing apart. 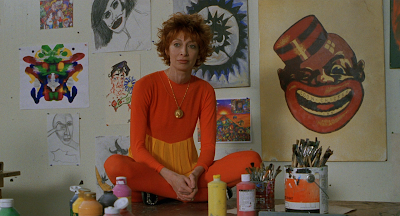 I daresay it's an honest to god masterpiece, with perfect music, art design, and a terrific supporting cast including Bob Balaban, Terri Garr and David Cross. 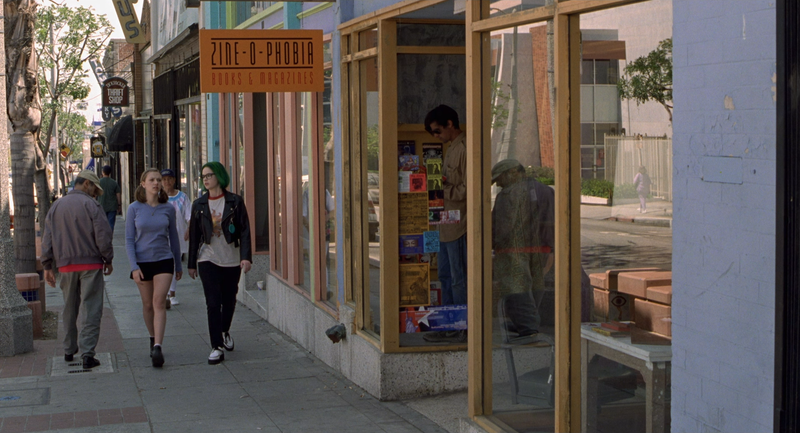 Ghost World was a 2001 film, so it naturally landed on DVD in 2002 as a new release from MGM. It was widescreen and had a couple extras (which we'll get into later), but it wasn't exactly a special edition. But aside from issuing it in other regions, that release was all we had to hold us until it was time for HD. It was first released in Germany in 2014, with a couple extra EPK interviews, and some problematic syncing issues. But finally in 2017, Criterion has given the film a brand new, 4k scan and delivered the special edition Ghost World has always deserved. 2002 MGM DVD on top; 2017 Criterion blu below. 2002 MGM DVD left; 2017 Criterion blu right. So, the first noteworthy change is the aspect ratio. 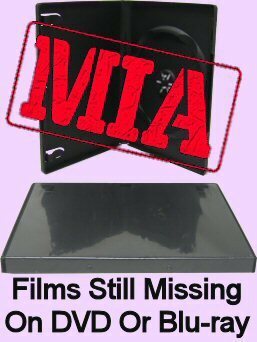 MGM's original DVD is anamorphic, but has very slim pillarboxing to a ratio of 1.76:1, while Criterion slightly letterboxes their image to a presumably more correct 1.85:1. This effectively gives us identical framing on both versions, but with slightly more picture on the sides of Criterion's image. Now, in terms of color, for once, the timing is essentially exactly the same between the old DVD and the blu, except their a little bit more robust and bolder on the blu. In fact, more robust could describe the blu-ray's relationship to the DVD in general. 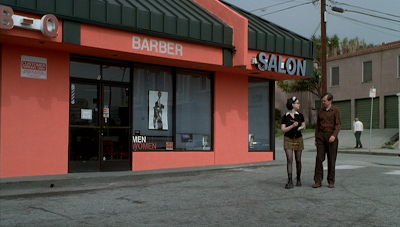 Naturally, the DVD is more compressed, but there's a very strong and appealing jump in clarity on Ghost World. Not only is grain resolved much better (if a little light) thanks to this new 4k scan from a 35mm interpositive, but as you can see in the close-up comparison above, all the lines and details of the image are a lot cleaner and clear. This is the kind of strong picture quality jump we buy blu-rays for. 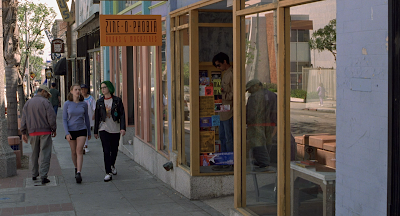 Ghost World has always had a 5.1 mix, so that's the only option we get on the DVD and blu-ray, but the blu-ray's DTS-HD does make the music sound fuller. Both discs also include optional English subtitles, with the MGM DVD also throwing in Spanish and French. Now, again, the MGM DVD was a little light on features, but it wasn't barebones. It included four deleted scenes, a decent 'making of' featurette, and what they call a "music video," but is actually the extended dance clip from the film 1965 Bollywood film Gumnaam that featured prominently in Ghost World's opening and closing credits. We also get the trailer and a couple of bonus trailers including an ad for the Ghost World soundtrack. Oh, and there's an insert with chapter stops. 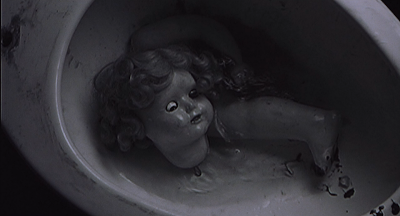 Criterion improved upon that in almost all aspects. First, they brought in some killer new features, most notably an audio commentary by Zwigoff, Clowes and producer Lianne Halfon. It's a pretty great track, apart from the fact that Clowes and Zwigoff's voices are so similar, it can be hard to determine who's speaking at any given time. Then, there's a very extensive 42-minute featurette, editing together new on-camera interviews with Johansson (a pretty impressive get in 2017! ), Birch and Douglass. Then, they not only carry over the deleted scenes but uncover a couple extra. And yes, they include the music video again, but the experience is greatly enhanced by a new, optional audio commentary. Here, an uncredited woman gives a very informed history of the film-within-the-film, and translates some of the lyrics,even taking a shot at singing along. It's pretty great. There's also a substantial, 40-page booklet with notes by Howard Hampton, lots of sketches and artwork from the film, and an essay by Zwigoff himself on the music in the film. 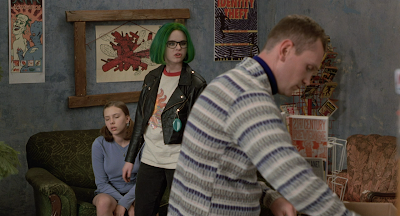 There's also a separate reproduction of an Eightball comic, where you can see some Ghost World scenes before they were transformed into the film, plus some other looks at Clowes' works. 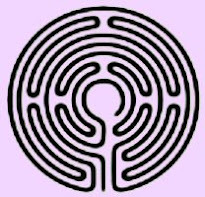 But you might've noticed one tedious, little absence. Yes, Criterion has "pulled an Ice Storm" and left out the original 'making of' featurette. It's not a huge loss, but it did have soundbites from Balaban and Buscemi, who are absent from Criterion's extras, and gives us some more glimpses behind the scenes, Clowes and Zwigoff on-camera, etc. Again, there's nothing really important in there, and the extras Criterion created totally blow them away; but it's still a little disappointing that they didn't include it, and/ or the extended EPK interviews from the German blu. Come on, fellas. 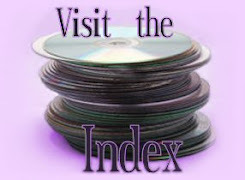 Now, if you've got those older discs, you've still got to hang onto them. This is a great blu that really exceeded my expectations, and my expectations are pretty high whenever I spring for a Criterion disc. I was thinking maybe I'd be fine with my old DVD, but I wound up biting and now I'm really glad I did. The film comes to fresh life, and the new supplements are essential. Unfortunately, it doesn't allow me to shuffle the old DVD out of my collection, but that's a minor gripe in the face of such a high quality edition we've just been handed.